“Public libraries are currently under attack as never before. Quite apart from the imperatives of cutting council spending, many critics question the point of public libraries. With the advent of the internet and the ebook, public libraries are described as out-dated. They are also accused of being too Middle Class and of being a luxury we cannot afford when other services are facing financial pressure. This page aims to address some of these points and to highlight the main purposes that libraries exist to provide. Oxford University study shows that reading books improves your life chances. Public libraries are seen as an important way to improve reading skills in South Korea where 180 new ones are being built. It’s interesting also that Russia is expanding its libraries in order to boost Russian culture. Using a library improves your children’s reading ability according to National Literacy Trust. “… a beacon of civilisation, a mark of what we as a country stand for. For we remain, per capita, the most literate country in the world – we produce and read more newspapers and books per head than any other nation. And it’s vital we keep it that way, as economic inequalities multiply, and the world divides into information rich and information poor.” (Tim Lott, The Independent). Scientific research has recently shown the act of reading the printed word seems to imprint knowledge better than using a computer screen. “A library has more effect on reading than a phonics check. Being able to have a wide range of books that appeal to different interests will do more to drive literacy than some of the government’s strategies.” Russell Hobby, general secretary of NAHT. The community aspect of libraries, including storytimes/rhymetimes and free picture books is especially important for new mothers and their children. Children can easily read five books per week and all but the most wealthy parents could not easily afford this. Even leaving aside books, the lack of access to the internet can reduce exam results by a grade. Public libraries can provide that access to children who do not have it at home. Lack of literacy exacerbated by lack of adequately funded libraries can lead to problems for British business, says the CBI. Libraries are one of the places people go when school fails them – Terry Pratchettcredits his education to Beaconsfield Public Library. They’re all about lifelong learning. Borrowing of children’s books is increasing. Education is for adults and senior citizens too – senior citizens use libraries for education (notably, the U3A), students for quiet study, those new to computers for computer training. New York has recently declared public libraries are educational institutions. “Libraries are not an indulgence. They can have a transformative power – especially for those marginalized, disenfranchised, alone, or simply open a world of stories and imagination to readers young and old.” Sharon Canavar, Chief Executive, Harrogate International Festivals. A significant proportion of the population (23% according to the Office of National Statistics) does not have an internet connection at home. Those people most in need are precisely those without an ebook or the internet e.g. unemployed, those on low incomes, senior citizen. Libraries offer online and access for all, often free. The United Nations has declared that internet access is a human right – public libraries uphold that right. In addition, using the internet means one can take advantage of special offers (e.g. comparison websites) meaning that by not allowing libraries and thus free internet access,the poor are being forced to pay more while the wealthier can pay less. During times of recession, libraries are a great way of saving money by meaning one can take out DVDs/Games cheaper, read newspapers, use wifi, internet, free community space. Similarly, libraries offer word-processing, printing, photocopying and fax. Many people on low incomes or mental health problems use the library as there is nowhere else to go. Ironically, this is sometimes used informally as a reason againstpublic libraries while others argue against libraries as being too Middle Class. They’re about the public good, equitable access for all members of society to public domain information of all kinds and in all formats, an appropriate balance within the law between demands from information users, and the need to respect confidentiality. Libraries improve the neighbourhood and increase house values. The library is often the only place where the user can talk to others. This goes directly against the stereotype of public libraries as quiet places. One user of the library where the author works has said that he would kill himself if the library closed down as there would be nothing else for him to do and no-one else he could talk to. Libraries are a free community space otherwise rare on the High Street. This is especially the case in small communities where, unfortunately, they are currently most under threat of closure.“The government and the council forget that people live in places like Walney. When they close the post offices, the clubs and the libraries, then the local people lose meeting places.” (Sally Whittaker, 97 years old, Cumbria). When libraries are adequately funded, people use them – see the record number of users at Hillingdon or any new library such as Portishead. Reports that claim library usage is declining take no account of the number of libraries that have closed or the lack of investment (note 25% decrease in bookfund last year). Alan Gibbons believes the 320 million visits per year to public libraries could double with proper leadership of the service. If one takes virtual visits into account, usage is increasing. Libraries are cheap to run. There’s an easy way to calculate how much public library use saves you at what is our library worth to you. When given a choice of losing their library or increasing council tax, people choose the library – for example, in Wiltshire. The same is the case, with many more examples in the USA, where there is a strong upward trend in library use. In the USA, a FCC report makes clear that libraries are highly used (p.216-7), especially for internet access, are proving essential during emergencies and usage is increasing. Measuring everything by cost rather than value can lead to massive problems – “This approach is tearing apart the invisible bonds of duty and loyalty, belonging and togetherness in the name of an ideology that nothing is more important than money,” said Phillip Pullman. For family history, local newspaper archives. Many offer subscription-only online family history tools such as Ancestry, for free. Start-up businesses often use libraries, be it for free access to British Standards online or for meetings/research or for computers/fax/photocopier. A “a beacon of civilization“ and a symbol of “what we as a country stand for”. 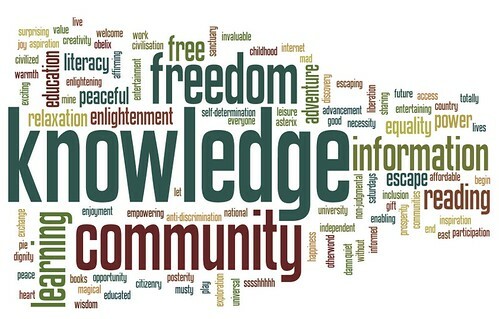 Intellectual freedom is basic to public libraries which help to sustain a democratic society. Libraries are increasingly lend E-books. Libraries are not being made obsolete by technology. Ten Reasons why the internet is no substitute for libraries. With the decline of bookshops on the High Street, Libraries may become the only place where one can browse physical books. The loss of book shops has led to loss of book sales – not all of it has migrated online. 88% of books are not available online, more print books published each year than in previous year. In addition, even those online are not entirely safe. Google proposed deleting its entire video archive in April 2011 and only stopped due to public protest. The same could happen with Google Books. Equally with other groups – Facebook have been deleting political groups without warning too. Public libraries have never been in competition with booksellers nor are they now with e-booksellers. Librarians are not booksellers. People buy books and borrow books – one does not preclude the other. Ebooks (other than those out of copyright) are expensive and so do not necessarily threaten libraries. Another analogy is radio and television – the advent of television did not mean the death of the radio. Add to this the other functions of the public library (see above) and it is clear that the advent of ebooks therefore does not mean the death of public libraries. Surveys suggest that only 15% if ebook owners give up on printed books. “Walking to the library is still the most ecofriendly way to read”. Search engines are too easy, making people think they have found the answer when they haven’t. Librarians are trained how to find the correct answer. The internet may not be free or equal in the future. “Net neutrality” is currently under attack, which may lead to two levels of internet provision – a full access paid for version and a poorer quality free version. Libraries are not entirely for Middle Class – Roy Clare (outgoing leader of the MLA) and John Redwood MP have both accused libraries, or campaigners, of being middle class – this is a response to them. However, what is wrong with the Middle Class using libraries anyway? They pay tax too. literacy is boosted by libraries, illiteracy by closing them down. Poor people need libraries for the free access to books and information. Ceasing council aid to libraries would mean only wealthy areas could afford the high cost of running them as a community enterprise, leading directly to the world of Middle Class Only libraries those who advocate cuts now sneer at (Boyd Tonkin). “Highgate library serves three council estates. Its learning centre provides training for children and adults. It provides the internet in a safe environment. It gives a crucial link to council services. Highgate library helps complement reading and teaching at my school. All classes visit and each pupil has a card. On top of organised visits, many come in after school. The skilled staff run well-attended groups and the Friends provide reading progress prizes for my pupils. It brings different people, and different parts of our community, together.”Headteacher on feared library closure in Camden. A full blog post answers this question. School libraries are being closed too. There’s always other savings that can be made other than x – especially senior local government pay (the Mail has stories on this most days), making services more efficient (see the Future Libraries Programme), closing down unnecessary expenditure elsewhere (glossy council newsletters are often favourite examples), cutting down on a prestige project (such as a multi-million pound HQ or car park), etc. Councils often have large cash reserves that can be used. Labour councils are accused by Conservative/Liberal Democrat supporters of closing libraries to exaggerate the impact of the cuts. Conservative councils are accused by Labour supporters of closing libraries for ideological free market reasons. Closing libraries is a false economy and the value of public libraries can be measured and demonstrated. The use of libraries in the USA has been impressively graphically illustrated as has the socio-economic value of libraries in Australia which return $3.56 for every $1 spent. There is a (UK) overview of the literature on how to demonstrate the value of public libraries here. Or you could argue against the actual need for the cuts themselves – UNISON factsheets. The government wants to encourage reading and literacy – so why cut libraries?